Sumatran orangutans live only on the island of Sumatra, in Indonesia. Lately, because of logging, they have been restricted to the northern tip of the island. They are found in primary tropical lowland forests. They live almost completely in the trees. Sumatran orangutans have long, fine red hair on their bodies and faces. The males have large cheek pads that are covered with white hair. Their legs are small compared to their muscular arms and their hands and feet are quite large. Males are larger than females. Females weigh between 65 and 110 pounds and can reach a little over 4 feet tall. Males, on the other hand, range from 110 to 200 pounds and can reach a height of almost 6 feet tall. Their arm span is around 7 feet! Female life spans in the wild range from 44 to 53 years. There have been no reports of menopause and females seem to be capable of giving birth up to their early 50s. Males, on average, live slightly longer (47 to 58 years). Captive Sumatran orangutans live to be around the same age as in the wild (mid-50s). In the wild, orangutans eat mostly fruit, but also young leaves, flowers, bark, insects and eggs. Their food choices vary seasonally, depending on when specific fruits are available. At the Zoo, the orangutans get two different types of primate biscuits, fruits, vegetables, and occasionally eggs and browse. Most mating occurs in the heaviest fruiting months (December through May). Females normally mate with the adult male whose territory they live in, but sometimes many orangutans gather to feed during high fruiting seasons and there are more males to breed with. Females usually give birth to one young, after 7 1/2 to 9 months. Infants stay with mom for 6-8 years! IUCN status – Critically Endangered. Orangutan habitat is very rapidly declining due to logging; it has decreased over 80% in the last 20 years! 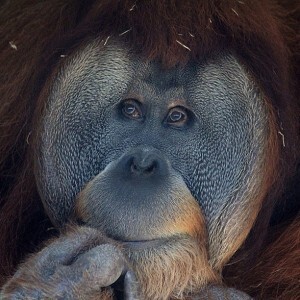 The greatest threat to orangutans is deforestation due to palm oil production. Palm oil is in a large variety of products (processed foods, baked goods, beauty products, etc.). It is a crop that is very important to the economy of Indonesia and Malaysia, but there are ways that it can be produced to decrease the amount of negative impact. This is called “sustainable palm oil.” The easiest way to help wild orangutans is by purchasing and consuming foods and products made with sustainable palm oil. There are multiple apps and websites to help you choose the best options (for example, Cheyenne Mountain Zoo makes an excellent app). The Sumatran orangutans are found in the Primate Building. We have 3 orangutans at the Birmingham Zoo. Our male, Oliver, was born June 14, 1980. Lipz, the female, was born March 28, 1982. Together, they have one daughter, Nairi, who was born at the Zoo on December 13, 2011. Sumatran orangutans are an important species for assessing biodiversity. Their protected status makes them an “umbrella species.” Umbrella species are animals that are selected for making conservation-based decisions, because protecting these animals indirectly protects many other species that inhabit the same area.